Oafa (oh-ah-fah) Essentially an explosive blimp, this hydrogen-filled race can easily be mistaken for a balloon. 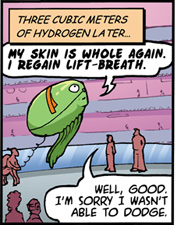 The tale of their evolution path is a fascinating one involving a metal-rich water world, acidic tentacles, tasty jellyfish, and a happy accident allowing escape from the appetites of everything that cannot fly (from footnote, 2012-01-04). Every known living Oafan is currently descended from reengineered Oafan that were created by the Prabstdi about five hundred years ago 2013-08-25. With the de-extinction of the Oafa 2013-08-25 and discovery of their ancient technology and ships, it became clear that their civilization battled the Pa'anuri some twelve million of years before the F'Sherl-Ganni did. 2014-02-28 The Oafa fled the war to their 'can full of sky' 2013-04-20 - a vast ship called Eina-afa. The Broken Wind was the insanely lonely Eina-afa AI. It reinvented itself as Iafi (loosely translated as "Little Wind" 2014-03-07) and became the new AI of an Oafa warship named Broken Wind. 2014-03-03. The planet-sized station Eina-afa was ceded to "a bright and enthusiastic young mind": Chinook, an AI reborn from the insane AI Tagii. The Oafa communicate with their own species via sign language & ballast (the ballast being air). With other species they use a translator, which is seen as a small grid device on their face. For those interested in being able to pronounce Oafan (oh-ah-fahn) words, here's a pointer: no dipthongs. Give every vowel its own syllable, just like that melodic donkey-cry, "ee-i-ee-i-oh" in the Old Macdonald song. Although, it should be noted, the english "i" in that song is, itself, a dipthong, AH EE. So... Oafan words will have SOME dipthongs. Probably. And you'll end up with some "Y" sounds in there sometimes [footnote, 2013-01-06]. 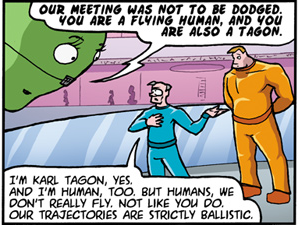 First appearance: At Mall-One, Karl Tagon & Kathryn Flinders are practicing Parkata Urbatsu, and Karl accidentally crashes into an Oafa, thinking it a balloon, and not realizing it is a sentient being 2013-01-02.